Tomorrow: Shop Edun At 70% Off & Support Sustainable Fashion! When fashion is functional we pay even more attention to the threads, so, when we heard about Edun's sample sale, it got us hook, line, and sinker. The sustainable brand, which was started in 2005 by Ali Hewson and Bono (yes, that Bono) supports local artisans and manufacturers in Africa by producing roughly 40% of its goods in Kenya, Morocco, Madagascar, Uganda, and Tunisia. But, Hewson and Bono's mission for ethical clothing doesn't sacrifice anything by way of style. That's why we're psyched to spend at Edun's 70% off sale, which starts tomorrow in Soho. With stock for both men and women, and totally wearable silhouettes for all, there's really no reason to hesitate in scooping up its comfortable, printed frocks, chunky-yet-breathable knits, graphic tees, and versatile outerwear. 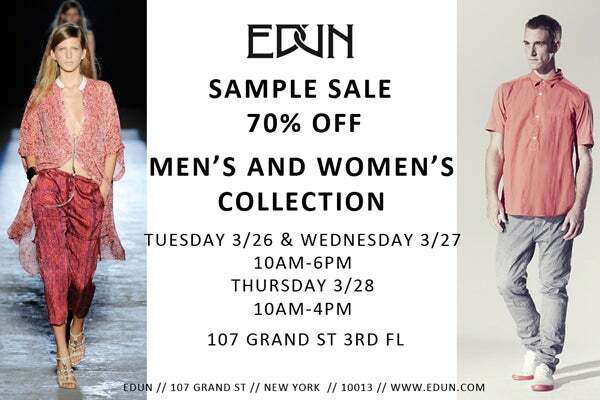 Where:Edun Sample Sale, 107 Grand Street (at Mercer Street); 3rd Floor; 212-274-1521. When:March 26 and March 27, 10 a.m. to 6 p.m., March 28, 10 a.m. to 4 p.m.